A cat that helped her 12-year-old owner battle bone cancer has been honoured at a special ceremony in London. 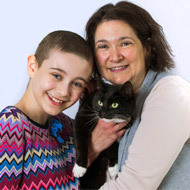 Eight-year-old Genie was crowned overall winner at the National Cat Awards 2017 for the incredible support and inspiration she provided Evie Henderson. Evie, who was diagnosed with bone cancer in March 2016, has endured six gruelling rounds of chemotherapy, painful operations, and long hospital stays away from home. During this time, Evie has gained strength from the bond she has with Genie, watching videos of her from her hospital bed and telling doctors that she needed to get better so that she could go home to see Genie. When Evie started to lose her hair, she noticed that Genie’s fur was moulting and that it helped her to feel like she was not alone. As well as being crowned overall winner, Genie also scooped the award for ‘Outstanding Rescue Cat’. Journalist Andrew Collins, actor Paul Copley and ‘The Vamps’ musician James McVey were among the celebrities that attended the awards ceremony, organised by Cats Protection. Mittens - winner of Furr-ever Friends - who helps a young girl with autism cope with a serious medical condition. Image (C) Fabio De Paola.